Okay so the people that post here should be only the people from that guild. Thanks!!! Guild made up of people that work and develop the storyline, arcs of events that will happen to the clans and to make sure the storyline is going smoothly and is in check. So what we basically do is that we work on the storyline and plot and make ideas! So lets begin! How about we start by finding out what upcoming events are going to happen in each of the clans. Okay so what do we have so far planned? There is the war in Moonclan which will be happening sooner. Will it involve more clans? Nah, since Moonclan is neutral most of the time the other clans will stay out of it. Also we need to figure when the civil war will be starting. For Sunclan, is Darkstream going to join the clan and what will she do? Oceanclan is going to have a tidal wave so maybe that could happen the same time as the civil war??? Moon isnt going to die out! I know what you said but I asked Bellastar if I could join the Storyline Guild and the Med cat guild and she said no problem, I'll add you in. But she still has not... I asked her in the topic called Guilds!!!! or something like that. You can be in the storyline guild, Leaf. So when is the tsunami going to happen again? When will the civil war happen is my question. I have no idea. I think we have to make up the time. I think the tsunami should happen at the same time as the civil war! I have a question. Should I make the topic Season & Time Guild? Sure you are the leader of that guild right? Yes it should happen at the same time so the other clans dont want to interfere or they cant interfere. Right now it's simply not going anywhere. I would have already made Aquafur start the seeds of rebellion,but he's stuck. I asked twice exactly what was going on with the training. So I have no idea what Aquafur is supposed to be doing. Is he in the middle of something? I can't go back to read posts at the moment,so I'll ask one of you to finish for me what he is in the middle of. Then I will start the war. Another thing: When is the first BIG plot going to come? Well he was doing an assement for the apprentices, but then that ended so now they are warriors and two warriors left the clan and left behind a kit, Violetkit. The firts major plot will be the civil war in Moonclan, The tsunmais in Oceanclan, and Darkstream in Sunclan (she will join Sunclan correct?) that will be a mjor thing that will happen. I also want there to be a bif forest fire after the civil war or during the civil war, whatever works best. okay so lets get organized: what are the moonclan plans? 1. Aquafur starts the civil war by rebelling Fallenstar. 2. The clan becomes divided-some of the cats want Aquafur to be the leader, while others think Fallenstar should stay the leader. 4. Fallenstar has her kits. 5. Fallenstar appoints new deputy to replace the traitorous Aquafur. The new deputies are now Harvestmoon and Lightpath. 6. Tensions rise between the two sides, final battle is fast approaching. 7. Aquafur steals one of his kits, the male Solarkit. 7. The two sides attack each other at Moonclans camp and they fight each other. 8. A wicked storm began days before the battle and now it reaches its peak. 9. Harvestmoon and some other meaningless cats die in the battle. 10. Lighting strikes and Lunapaw and Solarpaw face off, good vs. evil in a ring of fire, bathed in moonlight. 11. Solarpaw dies and Lunapaw wins. 12. The war ends with the death of Lunapaws sibling and the start of a forest fire. 13. The clan works together and escapes-obsevers destruction of their home by the fire at the old Indian temple. 14. Clan reunites, Fallenstar as the leader and Lightpath as the deputy. The other deputy becomes: ?????? I dont know who the other deputy will be after the war is over and Harvestmoon dies. Is Aquafur going to die? The storm is the same storm that causes the tsunamis for Oceanclan. Ice was surpised when her cat was chosen to be deputy since she was going to kill her off. So who will be the new deputy after the war? By that time some of the new warriors will have trained apprentices and most of the meaningless, free characters will have died off in the civil war. Who will the new deputy be after Harvest dies?? Do you want to have Fallen have her kits now? I think Shi will start the civil war soon if he comes on today. Okay,I'll get that started. I don't really consider the war to be a big plotline. It only involves one out of six clans. If we wanted it to be big,then we would find a way to involve the other clans. Maybe Aquafur would make deals with cats in other clans and that would cause Fallenstar to find allies,and then it really happens. Because if it's only one clan,it will be over in a few days. I mean,how many are actually going to be with Aquafur anyway? I know my cat, Wisteria is. And some free characters will be with him too. If you want Aqua to make deals with other clans that is fine. Just know that Oceanclan will be a bit.....occupied with the tsunamis they are facing so they are out. Maybe Aqua could get help from Sun and Fallen could help from Lava. Is that good? Ohh. Good idea. I'm going to have ask Runatone which side her cats are on because Solareclipse and Runatune are like the grown up versions of Solarpaw and Lunapaw. Could some cat's in Sunclan are on Fallenstar's side and are spying for her? Same in Lavaclan? Angelleaf is on Fallen's side. She quarreled with Wisteria about Eagelstar remember? What will happen to the cats who were on Aqua's side? Could Wisteria and Angel still be friends even after the war? Hol on a bit guys. If other cats are going to get involved moon needs a couple days to cool down from the whole violet thing and also, the kits have to become warriors before the war. The war is not going to happen for a couple more days at least. The war will not happen for awhile. As far as I'm concerned,it could take a month. Aquafur is not going to rush things,he's going to slowly build up support. That's going to be slow. The first Gathering place is destroyed because of the tsunami right? Will OceanClan's camp be destroyed? Is LavaClan going to have a disaster like Moon, Sun, and Ocean? Both lava and forest are goig to say how they were. But a rogue attack will happen in Forest. I agree with Shi, the war shouldn't happen for another month. just so ya know will be on vacation to europe for awhile, i will have my ipod touch and maybe my laptop but no promises that i will get on. i will be gone june 23 to jul 15ish. yes the old gathering place will be destroyed and then we will go to the indian temple. also oceans camp will be destroyed-two times! that is still a long time from now. So lets contiue planning. Um so this is what is going to happen for the clans right? This is a just a short list I made, any objections? With moonclan I don't like the forest ire, it's not needed, and instead of the secod tsunami why don't you make thatsomething else? Can they a have a forest fire not now but later on? Also I kinda had already had the second tsunami set in stone and sealed, so that will happen-wether you like it or not! Can you help me with the next set of events? Arcs are sets of events. We are in the first Arc and it will end with the much later event of the Rainclan Clan War. Then the second arc will start and then so on and so forth. They are like new series in warriors, we are still on the first the original and then the second will be like Midnight and then so on. They aren't going to have the same events though. So can you help with the future events of the clans with me? Yeah sure but i said before, it's not a main concern yet. Fallenstar's kits aren't even born yet, and the beginning of the fight happens on their warrior ceremony. Will Ocean and Lave join forces??? Well maybe. Moon is having the civil war so Sunclan doesn't want to deal with them right now. They fight against Lava and Ocean. But Ocean is having to deal with some tsunamis and building a new tsunami camp in case they need a place to stay, so Sunclan doesnt really attack them they just like steal their territory and change the border in their favor but they do attack Lava. Lava and Sun fight and then Oceanclan joins when its done with its tsunamis and rebuilding the camp. Like they find out what happen and are angry earlier but they are too weak with no camp and building another camp to do anything about it, so they loose more and more territory. But then they join with Lava and fight Sun and I guess, kill Darkstream and make Boar lose a life. Also I know we haven't even started the civil war but we should still plan ahead, so I was thinking that after this war the cats then go and start Dawn and Twilightclan. Then we are in a little set of events before Snow is made and then another even smaller one before Rainclan comes in and starts the war, and when the war is over the first arc ends and we go to the second arc. Also Moonclan stays out of the war because they are always neutral and they are busy with their own problems and after the war, they are busy rebuilding and strengthing ties with one another. So also I was thinking, that when we go to the next arc we should do a little time skip, like maybe 4 moons? Like I will post End of Arc One, Begginning of Arc Two and then like Four Moons later and then I will play as my charries. We will all agree though when we should do that after the war, since everythong has to develop and rebuild after the war over those moons. Perfect, expect I was really confused at the start because Bellastar said that Dawn and Snow and blah blah are ancient clans. Will our cats go the the clans? I think it should be six moons later, half a year. Tiger, if you read our seasons and time guild, you'll realize that Ocean says for kits and apprentices we don't have to go by real time, we could just have a week or two pass and then the kits become apprentices and the app. becomes warriors. I don't really want to wait six months for the war to happen. Okay so Tiger, may I suggest that Fallenstar's kits take two weeks? I've been waiting for this civil war FOREVER. When will she have kits? Another reason I want two weeks is that I want to rp the civil in S.H. (Summer Holidays) I have more time that way. Yeah me too, Jay go over to the season and time guild and maybe we can find a page number for a moon, a season and a year so that way it will be quicker for the civil war! Yay! So there names are Solarkit and Lunakit or Lunarkit? Get better soon, Fallenstar! Get it? She has fallen! FALLEN DOWN! HAHAHAHA! EDIT: Also lets continue on working on the storyline, especially since Shi has left ti is going to be changed. Okay anyway lets get working! Here is the now current storyline for the clans. Warrior ceremony for Redpaw to Redcry and for Jasperpaw to Jasperhowl, Apprentice Ceremony for Apricotkit, Coralkit, and Auburnkit. Auburnkit and Apricotkit become Auburnpaw and Apricotpaw and are warrior apprentices. Coralkit becomes Coralpaw and becomes a medicine cat apprentice. The Deadly Falter sweeps through the clan. A cure must be found! Fireeye and Darkstream form an allegiance together to corrupt Sunclan. They begin by slowly taking power as the cats fall to the sickness. They then convince Mazestar to attack Oceanclan and Lavaclan because they know the cure to the sickness. Sunclan attacks Oceanclan and Lavaclan. Oceanclan is weak after tsunami and their territory begins to be taken over without a fight. Lavaclan ends battle between them and Darkstream and Fireeye die and a cure is found for the Deadly Falter. Tsunami hits the clan. Some cats may die, but they will be free charries. Others may be hurt. They begin building makeshift camp in case any other tsunamis strike. Sunclan begins attacking cats and taking over territory. Oceanclan is weak after tsunami hit and can't do anything about it. Second tsunami hits, but they escape to makeshift camp and no one is hurt. They begin rebuilding old camp again. Help Lavaclan and defeat Sunclan and kill Darkstream and Fireeye. Sunclan begins waging war on Oceanclan and Lavaclan. Oceanclan is weak after tsunami and can't do anything to stop Sunclans advance into their territory. Lavaclan attacks Sunclan and with later help from Oceanclan, they defeat them and kill Darkstream and Fireeye. Fallenstar has her kits, Solarkit and Lunakit. On the day of warrior ceremony civil war starts. Clan is split in half, Fallenstars side and Aquafurs side. Aquafur steals Solar and makes him evil. Final battle happens and Solar and Luna fight in a ring of fire with a full moon in the sky. The clan is reunited together again. This timeline does not include any ceremonies that may happen over this time. Is this okay for everyone? Also here is a timeline of the clans orgins! In the begginning, there we only three clans-Hawkclan, Ravenclan and Eagleclan ruled by Eaglestar, Hawkstar and Ravenstar. This was before the twolegs had made their great empire, and the cats were normal cats but were wild. They lived with an Alpha, and a Beta. The Alpha kits began the new leader when they died. These clans died out when the corruption, civil war and battles broke out. (Ravenfeather is a descendant of Ravenstar, Eagletalon can be a descendant of Eaglestar and Hawkkit can be a descendant of Hawkstar) Hawkstar, Ravenstar and Eaglestar rule Spiritclan. Many generations passed and than a new clan emerged, called Snowclan. They lived on a cold island away from the other twolegs. They were propserous but then a tribe from the south (said to be a descendant of one of the more eariler clans) came to the island after aving a civil war. The two began to fight for power and food. Snowclan killed off the entire tribe, all except one cat who was trapped in the ice caves when they collapsed during the battle where the tribe had moved their camp to after having their old camp on a snowy field when it was destroyed by Snowclan. Snowclan had also lost many cats and after a few years they died out too and disbanded. The twolegs began to form an Indian Empire and many cats became royal cats of the Emperor. 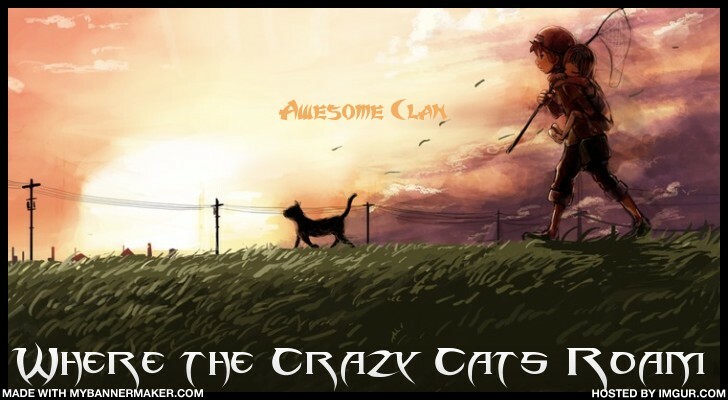 When the Empire collapsed due to the arrival of travelers and colonists, the cats formed six new clans, Dawnclan, Twilightclan, Moonclan, Sunclan, Oceanclan and Lavaclan. Twilightclan died out because on the island they lived on there was dingos which attacked their patrols and began picking off the cats one by one. No one would help them as they were expected to deal with their own problems so they disbanded. Dawnclan made their camp on a field, but it was actually a wetland that was in its dry season. When the wet season came the camp flooded and killed many cats and they disbanded as well, leaving only Sunclan, Lavaclan, Oceanclan, and Moonclan to survive and live on. They soon were forgotten by many cats.